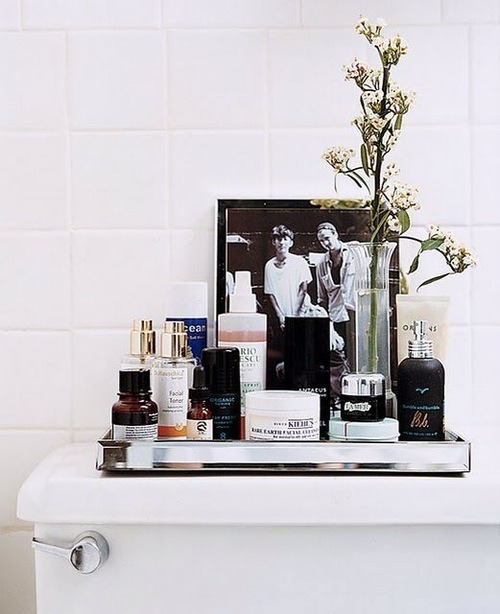 Mario Badescu’s Facial Spray with Aloe, Herbs, and Rosewater in the darling silver tray of someone’s daily essentials. In an age where we’re always in a rush and on the go, a product with multi-purpose functions is ideal; it’s no wonder that it’s a favorite amongst MB fans. What it is: A refreshing, hydrating mist to use anywhere anytime, simply formulated with fragrant Herbal Extracts and Rosewater for a pleasant, pick-me-up. How to Use: Rejuvenate dry, uncomfortable, tight skin with a few spritzes. Use it to moisturize skin in dry climates or indoors from heat or air conditioning, set makeup or give your skin a dewy finish. Spritz it in your hair for a light fragrance, or on the neck and back to keep cool. … It’s actually just lovely all over. Beauty Tip: Keep a bottle in the fridge for an extra cooling effect for hot summer days, or a quick pick-me-up, morning treat. Going to be outside all day poolside, at the beach, at a picnic, at a BBQ? Stash your Facial Spray in the cooler for easy access and a spritz or two whenever, wherever. We love to bring one wherever we go an instant fix, whether it be in our travel bag or in our everyday handbag! Definitely grabbing one of these with my next order! Or maybe one for the office, one for home..? Tempting! I’m so glad that the itrnenet allows free info like this!